It’s way easier than you think and requires minimal upkeep. A beautiful and homemade terrarium can make a fine addition to your indoor or outdoor space. You can simply put this in a glass container, which is a great idea for individuals who barely have much time to tend their garden. If you also have no space to grow plants, then a terrarium should address this issue since all you need is a small container to fit several typesof plants. 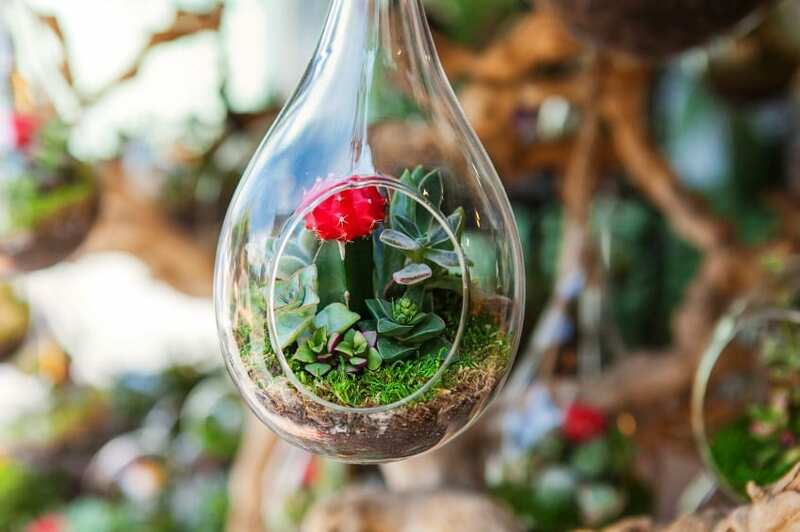 Terrariums may also serve as decorative items at the office or in your patio, specifically when space is an issue. The most important thing is you plan what you will put in the container and be sure to consider key factors that can affect the health and overall quality of the plants in it. The very first step in planting or making a terrarium is by selecting the right container. Ideally, you should opt for a glass container, which must have the right depth to allow the roots of your plants to grow. For instance, you may use a fish bowl or an aquarium with a rectangular shape that may serve as a good container. Lantern cloches are also suitable options because of the good humidity level, while tall terrariums will look great in bell jars. Vases or compotes may also look good, but it is important to water your plants if the container used is not airtight. Then, decide where you want to place your terrarium since a suitable location will ensure it of its low-maintenance quality. You may put it in a spot that receives indirect light and be sure to choose a place with comfortable temperature since you are not supposed to keep a terrarium in a warm location. Be sure to have your materials ready to start making a terrarium such as the potting soil with some peat moss, gravel and pebbles, activated charcoal to maintain the freshness of the soil and sheet moss to serve as a sponge that absorbs water at the bottom portion of the terrarium. Then, you will need some decorative items such as stones, shells, or some miniature garden gnomes to add some pizzazz to this fine project. After cleaning the aquarium or jar thoroughly, you may begin adding some rocks to ensure proper drainage. Mix the gravel with some charcoal and put a single layer of this mixture at the bottom of the container. Then, put some moss to prevent the soil from filtering deep into the gravel. Add in the soil and be sure to determine the amount by thinking of the length and size of the plants’ roots. Next, you can put the plants in and add a bit more soil when necessary. After placing the decorative items, do not forget to moisten the plants a bit, and your terrarium is all set!